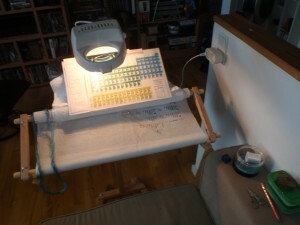 I have started to only stitch the linen thread part of each element, why I will explain further down in this blog post. This is why the last stitched element in this periodic system is the actinide Plutonium. This ending on the amount of elements has given room for the orbitals names, the shells names, and the maximum number of electrons in each orbital – hopefully it is going to be easy to understand for those seeing the finisched project. The shells names are under Plutonium. The orbitals names on the right side of Europium and the maximum numbers of electrons on the rigth side of Gadolinium. There is probably going to go some time before the next update on this project, since I am counting on it being when I have stitched all the linen thread on all the elements. 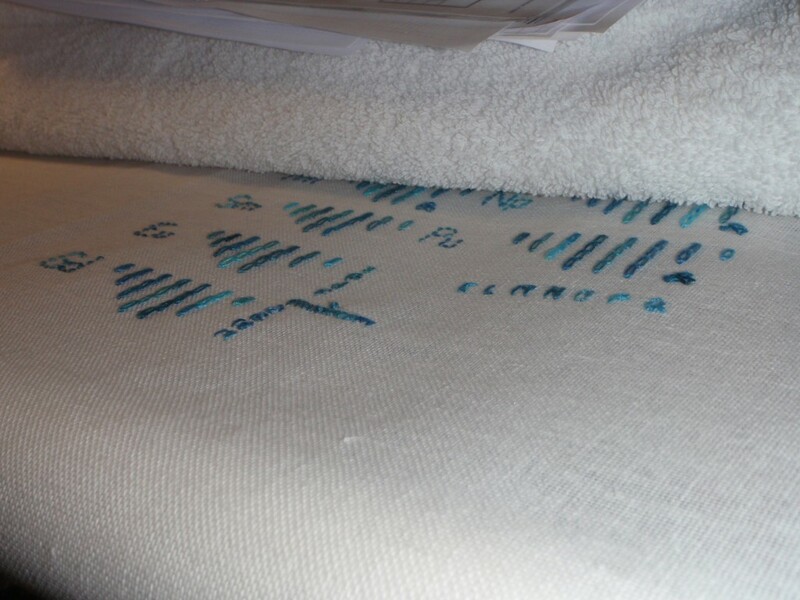 Efter stitching more and more the work became more and more difficult to handle – which I had to find a solution to. The solution was to mount the work on a scroll bar and use a stand for it. To protect what I have already stitched (especially to avoid the silk and the pearls from harm) I roll a white towel in the roll also. 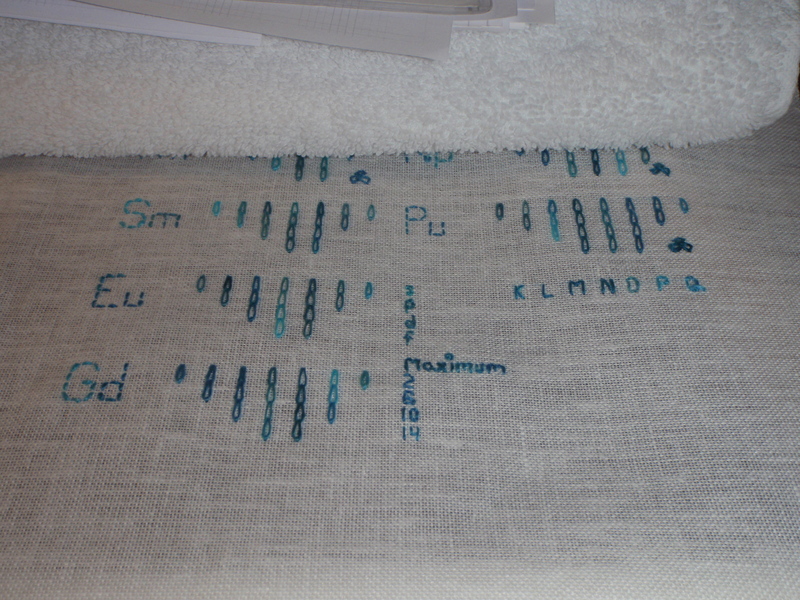 At the same time I have started to only stitch with the linen thread on each element. 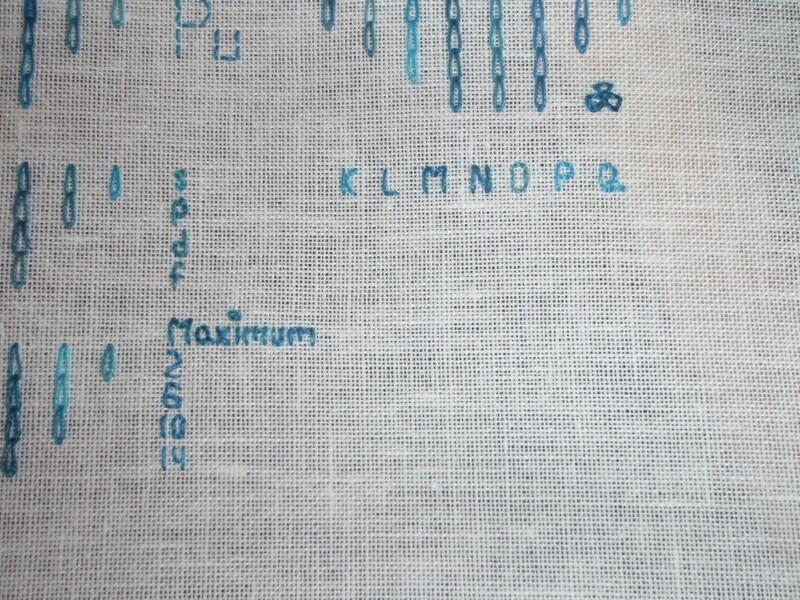 The plan is to mark the rest of the pattern – the part which is going to be around the periodic system – and stitch this at the same time as stitching the silk and pearls on each element. This is why I am only stiching with the linen thread for the moment. This entry was posted in Stitching the periodic table on October 25, 2014 by Tea.